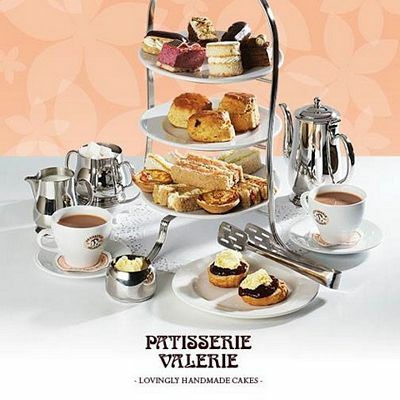 Conveniently located in the Atrium area of Union Square Shopping Centre in Aberdeen is the delightful Patisserie Valerie where many tempting treats await. 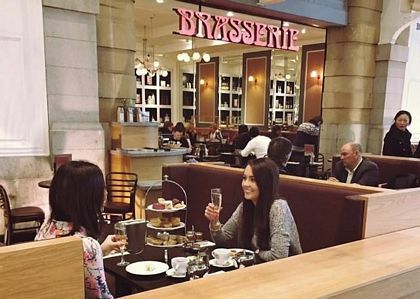 Recently they have added the Patisserie Valerie Afternoon Tea for two menu which we were happy to indulge in and review for our website - a tough job but we managed! Whether you go as a treat for that special day or just to rest from the rigours of shopping, a warm welcome awaits you from staff who are dressed smartly in their barista style aprons and crisply clean and ironed shirts. As you are led to your table you pass the vast array of tempting Belgium delights and know from the instant that gastric heaven waits at your table! Unlike some of the other Union Square restaurants and cafes this is much more relaxed, quieter and set back from the hustle and bustle of passing shoppers. It's an oasis of calm and a chance to gather ones thoughts and unwind. The waiters know their business and attend to the table without being too intrusive. This gives you the time to enjoy their food and drinks. The tea is proper leaf tea served in silver service with a clever infusion ball to help spread the flavours and stop any rogue leaves from entering your cup. 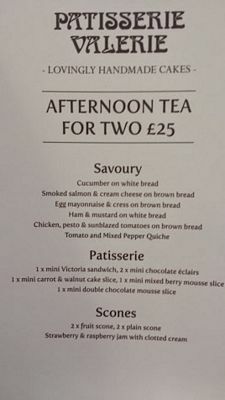 This is another rare treat and just one of many exceptional features of this afternoon tea that sets itself apart from others in the local area. Another quality that truly impressed us was that there wasn't just the usual choice of two fillings for the sandwiches. Instead each table gets a platter of two finger sandwiches of each filling, of which there are five. My favourite was the chicken pesto and sun blazed tomatoes whilst Mrs AboutAberdeen enjoyed the smoked salmon and cream cheese so much that she ate both. This gave me the perfect excuse to indulge in two of the ham and mustard, knowing her dislike of hot flavours. This abundance of finger sandwiches helps to overcome any difficult decisions over choices, likes and dislikes. The chef makes these fresh and can cater to any dietary need not met on the menu so that personalised fillings can be quickly prepared. The chef doesn't scrimp either, demonstrated by the chunky portions of meat, fish and vegetables. The food and drinks do arrive quickly at the table. We were just pouring our tea and hearing about the cake club where regulars can join for free and receive a free cupcake on his or her birthday and receive 10% off their next visit when our serving of treats arrived. I almost wanted the waiter to go Tadrah! or at least a fanfare of trumpets as she laid them down. Our eyes were immediately drawn to the colourful cakes on top for which this fine Continental Patisserie is famed. We were good though and after eating the sandwiches, and feeling quite full, battled on for the sake of this review and tried their warm scones. There were two fruit and two plain, though describing them as plain does not do them justice. Wonderfully light and crumbly and best of all they were served with a large silver pot of clotted cream that was just on the right side of chilled. The only dilemma was whether to do the Cornwall or Devon tradition of jam or cream first. Even the pots of jams would have catered for all tastes given the wide range available. About half way the waiter perfectly timed our need for a free top up of the delicious tea, and even this had various choices for the discerning diner. Still eyeing up the desserts section we remained patient and munched through the warmed tomato and mixed pepper quiche that was rich with fillings and secured with a moist but firm pastry base. And finally we were rewarded with the delights for the sweet toothed. My good lady took command of the delicate server tongues fearing my clumsy hands would drop the cakes. We each nibbled on a mini chocolate eclair before sharing a light and fluffy Victoria sandwich with its inner pleasure of light jam and cream. This was followed by a rich moist carrot and walnut cake. What really impressed me during the meal was that the waiter came over and laid down fresh cutlery so that we could share the cakes without spoiling their flavour with remnants of sandwich or scone fillings. Not that that would have been a problem, it's the sort of menu where you lick the cutlery clean because you don't want to miss out on any tasty morsel. Proving the chefs talents we rounded the afternoon tea off by sharing the mouth refreshing mixed berry mouse slice topped with an intricately wave shaped white and dark chocolate shard and the heavenly double chocolate mousse slice. A very enjoyable dining experience and one to be often repeated between visits to Cineworld or trying to tempt Mrs AA out of nearby Hobbycraft. It was well worth paying the £25 price and the platter could easily be shared by three. There is also the option of paying £30 for a prosecco upgrade (glass of prosecco each as well as tea). Our experience was made more pleasurable thanks to the courteous and attentive staff. Go try!